If the GOP is trying to attract female voters in 2016, that plan isn't going so well. 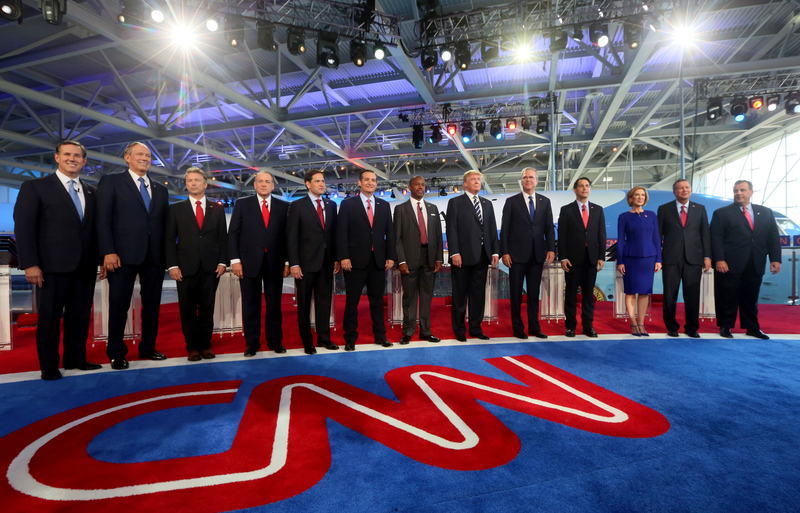 Like they did when they first faced off on Aug. 6, the Republican candidates said terrible things about women at the second GOP debate Wednesday night, from Donald Trump's attempts to be as controversial as possible to incredibly sexist statements the 10 men and one woman on stage didn't even seem to recognize were sexist. At this point no one is surprised when the Republican candidates advocate policies that would negatively impact women and the children who depend on them. Technically, the GOP may be the "party of women's suffrage," as Carly Fiorina states in an ad her PAC released this week, but it hasn't done much for women lately, and if we believe what the candidates have said so far in the primary campaign, a Republican in the White House would only mean worse conditions for anyone who identifies as female. Let's review: Fiorina opposes the Paycheck Fairness Act and raising the minimum wage (two-thirds of workers on minimum wage are women). Ben Carson, whose poll numbers have been steadily climbing, construes abortion as racist (and mistakes Plan B for the abortion pill RU-486). Carson also isn't sure domestic violence is real. Jeb Bush thinks women's health doesn't need so much funding. Rand Paul voted against the Paycheck Fairness Act and voted against reauthorizing the Violence Against Women Act. And in the first debate, Marco Rubio didn't remember that women are part of the abortion debate. With all of that in mind, no one was expecting a dramatic turnaround on any of these issues in the second debate. Mostly we were expecting Donald Trump to insult Carly Fiorina's face to her face. And while there was no one clear "binders full of women" moment, the candidates came close. Once again, what should have been a policy sparring match felt like a contest to see which contender was the most out of touch with what women care about in their lives in general and 2016 specifically. Trump continued his long history of criticizing women's appearances when he said of Carly Florin in a recent interview with Rolling Stone, "Look at that face! ... Would anyone vote for that? Can you imagine that, the face of our next president?!" He seemed to try to walk that back in Wednesday night's debate. When the issue came up in the debate, Trump said, "I think she’s got a beautiful face and I think she’s a beautiful woman." Evidently, Trump thinks the problem with his comment was that he said something negative about Fiorina's appearance, not the inherent sexism in criticizing a female opponent for her looks rather than her stance on various issues. Bragging about how he has vetoed funding for Planned Parenthood eight times in New Jersey, Governor Chris Christie suggested that the GOP candidates not debate each other on whether they have adequately fought the women's reproductive healthcare provider but rather target Hillary Clinton, who he said believes in murdering children in the womb. Not only did he reinforce the belief that pregnancies are children — and go on to perpetuate the myth that Planned Parenthood conducts abortions to profit off selling the organs of aborted fetuses — he recast support for women's reproductive rights as support for homicide. Being patronizing was a theme for Trump Wednesday night. Criticizing Jeb Bush for suggesting that women's healthcare might be overfunded, Trump presented himself as the candidate who would "take care of women." Women don't need or want to be taken care of, Donald. They just need access to quality healthcare. This question, which Gov. Mike Huckabee said he would pose to any prospective Supreme Court justice, isn't in itself offensive. What's offensive is what isn't included in the question: the experience of the woman carrying a pregnancy, and what her value is relative to that pregnancy. This sounds like a great, empowering quote, but it's actually not. Fiorina was answering a question asked of all 11 participants in Wednesday night's debate: Which woman would you put on the $10 bill? Fiorina punted, saying she wouldn't change the bill and that doing so would be just a gesture. It was clearly an attempt not to position herself as someone banging a drum for female representation (even as she totally represented as the only female candidate in the debate). The problem is that representation is actually incredibly important to showing any traditionally marginalized group, including women and girls, that they can fully participate in the institutions around them. As women pointed out on Twitter, the worst thing said about women in the debate was nothing at all on multiple issues that directly impact their lives, from the aforementioned minimum wage to childcare and paid family leave. That's how much female voters matter to the GOP.